Adults $4. Children under 12 are free. Sell your guns and hunting accessories. Tables are $30. 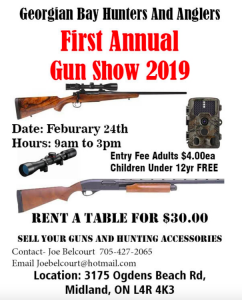 For information, please contact Joe Belcourt at 705-427-2065 or joebelcourt@hotmail.com. February 24, 2019 – 9 a.m. to 3 p.m.